hree Rivers RC&D Council, Inc.
Data from seven measuring stations is stored in the Portneuf River Basin VDV database system. Data originate from Campbell Scientific dataloggers. 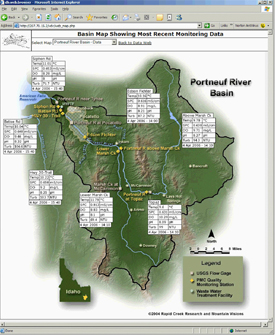 The Portneuf River Basin program runs Vista Data Vision applications for their logged data, database storage, displaying data to the web for its users, and for reporting.